RALEIGH, N.C. (AP) -Joe Corvo took the questions in stride, mostly because he surely expected them. Yes, this game meant more because it came against his old team. Yes, he mentally marked this game on his calendar weeks ago. No, he holds no grudge against anyone for the trade that sent him from Ottawa to Carolina. 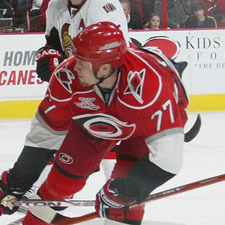 And the fact that his first NHL hat trick came in the first game against the Senators, the Hurricanes' 5-1 win Sunday? "What can you say?" Corvo said. "If I got to write a storybook ending, this would be it." Two of his goals came on the power play and goalie Cam Ward needed to stop only 16 shots as the Hurricanes bounced back from their worst loss of the season. Patrick Eaves, sent to Carolina along with Corvo in that Feb. 11 trade, also enjoyed the reunion, getting his first goal since then to help the Hurricanes improve to 13-4-1 in their past 18 games. That stretch includes an 11-1-1 run at the friendly confines of the RBC Center, where they will play four more games this season. "Anytime you get traded, your world kind of gets turned upside down," Eaves said. "It's hard for you not to come out and want to play your best." Scott Walker also scored for Carolina, which was coming off a miserable performance Friday against Buffalo. Ward was pulled after giving up four goals in seven shots in the first period in that one - the final score was 7-1 - but he was much better against Ottawa. "It was a whupping," Corvo said. "It was real important to put that one out of our minds." Dany Heatley scored for the Senators with a two-man advantage about 3 minutes into the game, and they still had nearly 90 seconds of power play left to increase their lead. Yet the Hurricanes held on, thanks to some brilliant penalty killing from Eric Staal. He had two excellent scoring chances while Carolina was short-handed, then deftly controlled the puck with a bit of a skating exhibition to use more time. By the time the Hurricanes were back at even strength, they clearly had seized the momentum. "Our special teams both were very good," Staal said. "We did everything well. It was a great win." It carried over when they got their first opportunity on the power play. Defenseman Mike Commodore, who was traded along with Cory Stillman to the Senators for Corvo and Eaves, was called for boarding, and Eaves was there to take advantage. He redirected a shot from Frantisek Kaberle past Martin Gerber, another former Carolina player, to tie the score, and the Hurricanes were on their way. They got a 4-on-3 opportunity a few minutes later and Corvo scored his first goal, beating Gerber with a low slap shot that into the bottom right corner of the net. "We were undisciplined and unfocused," Gerber said. "We've got to blame ourselves." The lead grew to 3-1 when Walker scored, using a nifty cross-ice pass from Tim Gleason. At that point, with Carolina controlling play, the only question about the outcome became the final margin. Early in the third period, on another power play, Corvo got his second goal with another hard shot from the blue line. "He had lots of opportunities," Ottawa coach Bryan Murray said. "We gave them 11 power plays. That's his role. He didn't do that for us but we probably didn't get that many power plays in a game ever when he was here." Corvo's final one came with 2:10 left in the game, when he completed a rush on Gerber to make it 5-1. "That was great to see," Staal said of Corvo's performance. "I don't think that happens very often." Notes: Carolina outshot the Senators 32-17, including 23-10 over the final two periods. Commodore was called for two penalties in the opening period The Hurricanes have a two-game road trip to Atlanta and to Florida before returning home for consecutive games against Washington and Atlanta.